In a letter sent to all pastors by Archbishop Charles Chaput in January of this year, it was announced that the Archdiocese of Philadelphia is transitioning to a later age for the reception of the sacrament of confirmation. While in recent decades the sacrament has mostly been administered to children in grades four, five and six, going forward it will be administered to those in grades seven and eight. 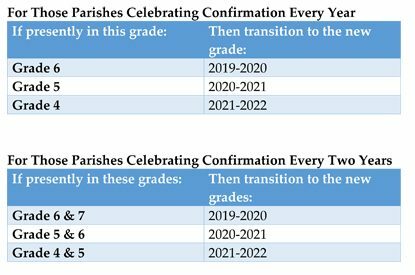 Archbishop Chaput stated there was favorable discussion of this new standard of higher grade levels for the celebration of confirmation at a meeting of the Council of Priests, and that the revision was supported by the council. “I am hopeful that this new standard of 7th and/or 8th grades will better prepare our candidates for the sacrament of confirmation to receive the gifts and graces of the Holy Spirit to live more boldly the faith they have received in baptism,” he wrote. A sample letter from parish pastors to parents explained the archdiocese conducted a two-year-long study regarding the grades for confirmation. The Council of Priests “voted almost unanimously” for the higher grade levels on June 29, 2017, the letter said, and last summer a consultation with the priests of the archdiocese was conducted. “This consultation supported the June 29 decision and on Sept. 21 the Council of Priests again voted in favor of this change from the practice of confirmation in grades 4, 5 or 6,” the letter said. It further explained that at the recent Jan. 18 meeting of the Council of Priests, the archbishop “approved the implementation plan” for celebrating the sacrament of confirmation in the archdiocese. “Therefore, beginning in the 2018-2019 school year, only those parishes which presently confirm in grades seven and/or eight will celebrate the sacrament of confirmation,” the letter said. The changeover will take place over three years, beginning in the fall of 2018. Such a change probably would have little impact on Catholic elementary schools where students normally are enrolled through eighth grade anyway. Could it affect Parish Religious Education Programs (PREP) where more often than not students drop out after the year of confirmation? At St. Robert Bellarmine Parish in Warrington, Director of Religious Education Donna Heeney has been overseeing a huge PREP program for decades, and she thinks the new standard won’t have any effect. Her candidates are presently confirmed in sixth grade, about 70 this year, and in her parish she sees very little attrition prior to confirmation at whatever age the sacrament is administered. Heeney herself is from a generation when confirmation was celebrated at a much younger age. She was in second grade when she was confirmed, which was not unusual in past decades. As to whether a particular parish should choose to have children confirmed in either seventh or eighth grade, the directive advises, “Pastors are encouraged to meet with the DRE, the school principal and others who should be included to discuss and determine the grade of choice” for candidates for the sacrament. “In this circumstance for the sake of curriculum especially, all should agree on the same grade,” the letter advised. 1-Payment information for 2018/2019 was sent home this week with our children. Any LATE PAYMENTS RECEIVED AFTER JUNE 30th WOULD BE CHARGED A LATE FEE. 2-Children who miss any more than 3 classes per ccd year (Sept-May) will have to repeat that level. NO EXCEPTIONS. 3-The change of confirmation from 6th grade to either 7th or 8 th grade. Our parish chose 8th GRADE. and my daughter WILL NOT be returning in the fall. What an awful decision based on no factual data! Kids are very savvy these days and have no problem with comprehension of the importance or meaning of the sacraments at 11 or 12 yrs old. The children and families get much busier as the children enter middle school. There is so much to balance between school pressures, working parents and sports/activities. My faith is a priority but in this day in age, we have many other things to attend to during the busy weeknights. My children were due to receive their confirmation next year in 6th grade. Whom ever made this decision, obviously doesn’t have to juggle multiple responsibilities with a busy household. Two more years of Prep one night per week is not reasonable. Very poor decision!! You will be losing many families. You are going to lose a ton of kids. This is absurd. Current children in prep should be grandfathered in. I’m really disappointed. Not sure we will be continuing. This is absolutely ridiculous. Just another way for the Catholic Church to get more money out of you. Bad move on the church’s part. Now most kids will stop after communion! The notion this is a “money grab” by the Archdiocese goes to show how cynical we Catholics have become. Parents are the reason why children do not attend Mass or PREP, it is as simple as that. The children are not being punished because they are being further educated about the sacrament of Confirmation and how it connects to their faith lives. It is because in most cases, sorry to say, the parents are unable to remember or understand the catechesis themselves. A few have suggested that catechesis should involve the entire family and in this day and age I absolutely support this idea. However, these families still need to come together and be instructed as a parish community so everyone is on the same page and can assist one another in this journey. I have taught in the PREP program for over 25 years and am a witness to the issues. I support the Archbishop and his decision. This is solely an attempt to get more money out of PREP families. Instead it will cause them to stop after communion. No one wants to go to PREP until 8th grade. Bad decision. “bishops, pastors, principals and directors of religious education noted there is a much better understanding of the sacrament of confirmation by older grade school students.” It doesn’t take a genius to figure that out. What’s disturbing and disconcerting is that I don’t see “parents” listed in those providing an opinion. Parents could’ve provided a different and meaningful perspective and it’s highly disappointing that they were not consulted. Kids in 8th grade (and even 7th) are preparing for high school and have far greater stresses and life/school pressures in that phase of their adolescent lives when compared to 6th grade. And as pointed out, years ago Confirmation was in 3rd, 4th and 5th grades. Why was it okay back then but no longer now?!?! I hate to sound jaded but I sadly get the sense that this is more of a money move than anything else. The Church’s overwhelmingly poor response (and that’s an understatement) to the abuse scandal and other controversies has made me jaded, and how they’ve handled things in the past have been draped in money & reputation preservation rather than in the best interests of the flock to which they serve, and sadly that again may be the case here. Instead of consulting with the flock they serve, they avoided the flock and kept this decision internal – why is that? Maybe they didn’t want the flock’s input?!?! I am a CCD teacher and we always tell the kids that CCD does not count as Mass. When the kids are told this, a common response is : Our Parents Won’t Take Us. Kids (and parents) get part of this attitude from our Protestant brethren who send the kids to Sunday School while the parents are in the sanctuary hearing the preacher. Kids know their Protestant friends attend Sunday School regularly. Another thing I see, and remember as a kid: many kids (and sadly many parents) looked at confirmation like a “graduation” and quite a few disappear. I was confirmed in 9th grade (I was a public high school kid in the 1980s) and although I fulfilled my Sunday obligation weekly (and was an altar boy nearly every Saturday evening for 6 years), I learned much more about the Catholic Church through the Boy Scout Ad Altare Dei program than I learned in three years of attending CCD and confirmation prep. Bottom line: parents need to take their role in faith formation seriously. Confirmation is not about keeping up appearances, or getting money from relatives. Are you taking a shot at Protestants? I fail to see how bringing any reference to Protestant’s on this topic adds any validity to your discussion. As a former Chreaster and Catholic school parent, I see this move as a way to better expose those families that don’t participate in weekly mass. Yes you may get a couple PREP families to become more devout, but you’re penalizing the Catholic school families. Those families are now going to have to juggle even more the last two years of their children’s elementary education. Public school families don’t have 8th grade graduations and parties, but Catholic school families do. And all families have confirmation celebrations. So now if both are within a year – which suffers? – the celebration of faith or the celebration of going to high school? I think the archdiocese neglected to consider this time honored celebration of faith that happens outside the church walls. A long overdue change. 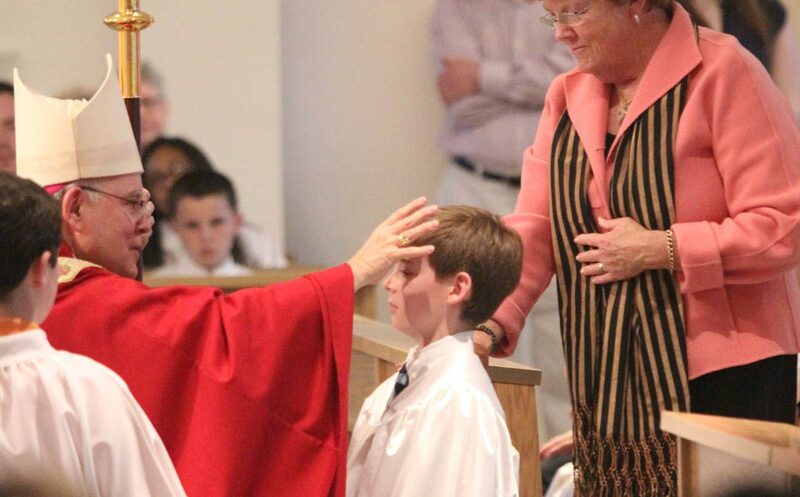 Most dioceses in the United States celebrate confirmation in the 8th grade when children are more mature and have had more time to appreciate the sacrament and it’s meaning. The complainers need to stop whining and get with the program. Made my Confirmation in April and Communion in May in 1939, in Philadelphia. Still a church goer. Believe in younger age when the little minds are eager to absorbe and retain information. I taught seventh grade CCD before it became PREP. We had to deal with the problem of some students going to Jr. High which was seventh grade. Most of the students did not go to CCD. This caused complaints that why should they attend CCD, when their friends did not go. I am happy with this rule. Again, the Archdiocese is shooting itself in the foot. No direction or advance notice was given to families and certainly no good reason was given to parents about why this decision was made. Of course it’s about money! I love my faith but am losing trust in the church … there is nowhere to turn. Very disappointed in this decision. Our kids are mature in 6th grade to make Confirmation. Eighth grade is a year of focusing on high school placement or acceptance tests, etc. I strongly believe this is to funnel more money into the PREP program and keep kids in Catholic School. Very disappointed in this decision. Our children get so excited that they were close to recieving this gift and now they need to wait another two years. What is happening to our religion? I agree with Cindy Coleman about switching to a faith formation program where the catechists equip parents to be the teachers of the faith. The American Catholic Church, especially the Archdiocese of Philadelphia, has 2 to 2.5 generations that do not have the basic doctrine and traditions of our Catholic Christian faith that they ought to have to help their kids in faith formation. Our parishes need to empower parents from 20 something to 40 something with the knowledge that the wonderful sisters and, in parishes and in Catholic High Schools, priests and brothers, used to so lovingly, if not so patiently, try to teach their students. In the pre-Vatican era, we here in Philadelphia concentrated on building a school first before we even thought about a worship space, and that may not be the worst thing to do! But, because parochial schools were the chosen priority, the faith formation of those children whose parents chose Public education was NOT THE PRIORITY. And any and all PREP programs need to be faith in action based. Our youth, from pre-K to high school, need maybe even want to see faith in action. Reaching out to seniors in the parish who may or may not be able to be with us on Sundays for Litiurgy needs to be accented at each level of faith formation. We need a change in our religious education programs….but this is not the one we need. Gone are the days when children could be sent to parish religious education for 90 minutes a week and go home to a family where Catholicism was practiced. As one indicator, about 75% of Catholics don’t go to Sunday Mass, yet many still send their children to religious education. I prepare children for First Penance and First Holy Communion in 2nd grade. Many, some years a majority of the children in my classes, have no experience outside of religious education of meeting Jesus or growing in their faith. We need to move to the model being adopted in many places to work in partnership with the parents to assist them as they catechize their children. We are in a crisis and moving Confirmation to an older age isn’t addressing that crisis. Needs to be 2nd or 3rd grade, many of these decisions are made to hold the youth/families into failing programs that do not give them fundamentals of the faith. Poor strategy. This type of change should be phased in and/or parishes given time to implement. There are ~9 classes left this school year and now you want to add another full year for kids that have already started to prep for their confirmation?? I for one know of at least 3 parents who won’t be returning because of this. Thank you for consulting with the parents!? Don’t they have any input? My niece is very upset because she was preparing for confirmation and now will have to wait. My brother is most likely also going to pull her out. He feels like this is a money grab by the church to keep the tuitions coming in. Another way to keep children in PREP longer is to have report cards. @Bill, I am a catechist in 2 parishes. Both have mid-year progress reports and also report cards. How do you envision report cards (which we already have) assist in keeping children in PREP longer? I am guessing your parish does not have report cards? I don’t find they particularly motivate many parents. I hand report cards out on the last session of the year. We have a closing Mass. Many children do not come that day and literally have said, “Mom said I don’t have to come next week because it’s only Mass” I am sure you are as saddened as I am to hear a child who just made First Holy Communion call it “only Mass”. Most PREP teachers in our parish hand out the report cards the week before our closing Mass, as so many children skip the Mass. I hand them out that last session. No parent who did not bring their child to closing Mass has ever bothered to contact me and ask for the report card.